Comments Off on Apply Now! Who wants to earn some GREEN this summer? We’re Hiring Bar & Grill / Beverage Cart Attendants for the 2015 Season. Experience preferred but not required. Casual, fun, fast paced environment! We have a variety of positions and shifts available. Hourly Wage plus Tips, Food & Golf Benefits. Call 603-894-4653 Extension 10 for more information. Comments Off on Get ready for the 2015 golf season with the 2015 Pro V1 Loyalty Rewarded promotion. Get ready for the 2015 golf season with the 2015 Pro V1 Loyalty Rewarded promotion. 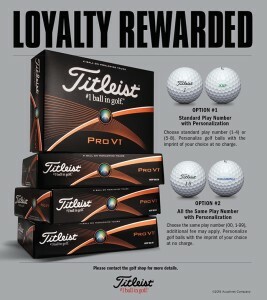 Purchase 3 dozen or more Pro V1 or Pro V1x and get 1 dozen at no charge. Please contact the golf shop by phone (603)-894-4653 or email (gwilliams@scottishhighlandsgolf.com) to place your order. Price per dozen is $48.00. Maximum of 17 characters per line (including spaces). All 4 dozen must have same personalization.